A photoresistor or photocell is a light-controlled variable resistor. The resistance of a photoresistor decreases with increasing incident light intensity. 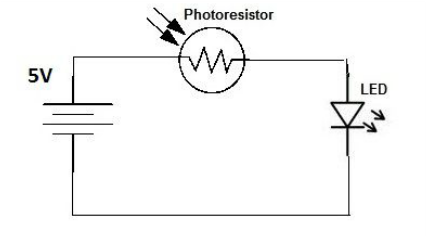 A photoresistor can be applied in light-sensitive detector circuits, and light- and dark-activated switching circuits. It's also called light-dependent resistor (LDR). 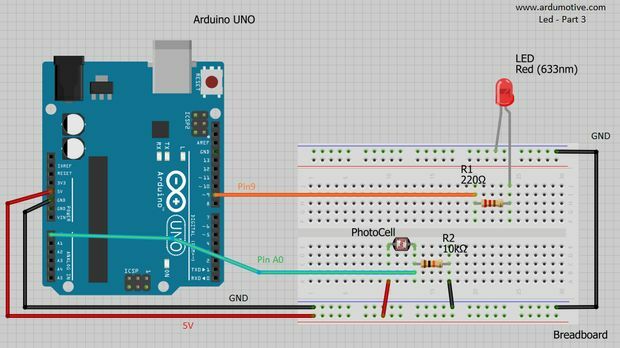 In this tutorial you will learn how to use a photoresistor with and without arduino uno. Let's see how a photoresistor react in light. Build the circuit above and notice how led brightness change. The resistance value becomes smaller when there is much light in the room. So in the dark the led remains off because the resistance has become very big. The Arduino will help us to reverse this situation, let's see how in next step. //You can change value "25"
For example, try to change "25" value and see how it changes the program. You have successfully completed one more Arduino "How to" tutorial and you learned how to use a photoresistor!